“La, la, la, la, la.” Pam was humming to herself quietly as she pedaled her tricycle around the neighborhood. She weaved back and forth across the sidewalk, sped up and down driveways and steered her way down the street. 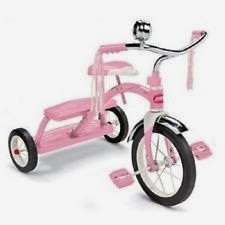 Being four years old, Pam’s tricycle was among her top five favorite possessions. When she got bored with her parents and other adults in her life, she could always hop on her tricycle and ride around the neighborhood. One particular day when Pam was riding her tricycle, she decided to try something new. The road that led into her driveway was a hill. She decided the best way to get the most speed would be to start at the top of the hill and peddle as fast as she could into her driveway. “Ready, set, GO!” Pam said to herself and she started down the hill on her tricycle at slowly at first, but gaining speed. After a few yards, Pam felt like she was flying. The wind was ripping through her hair and she felt that rush of adrenaline that tends to come when you’re a four year old racing into your driveway at top speed. The next thing Pam knew, the closed garage door was just three feet away from her and it was getting closer by the second. She started to rethink this grand idea! She found herself hurtling straight towards the garage door, her feet off the peddles and scraping the ground in an effort to stop. The pain was extreme. There was a dullness on her chin and red stains on her shirt. She ran in the house to the mirror, crying loudly, and saw that her chin was completely split open. She was panicked to see the flaps of skin hanging off her chin. Pam was rushed to the hospital in her neighbor’s car (her dad had her family’s at work) and she remembers looking up at the doctor as he was preparing to sew her skin back together. “This won’t hurt very much, I promise,” the doctor said. That proved to be a false statement because Pam felt the needle pulling the thick black thread through her skin and choked back tears, trying to concentrate on anything but the pain. The stitches were able to sew Pam’s skin back together just fine and she got away from the tricycle accident with nothing but a tiny scar on her chin, visible only if one looks very closely. As I do my internships and work with young students who are burdened with ASD, ADHD and other non-verbal learning disorders, I think back to the times we all had of simply being a kid. Every child has painful situations they must manage in an age appropriate manner. I hope I can "stitch" the fragmented lives of these young children with the skills necessary to lead a healthy fulfilling life. Editors Note: Stephanie is my oldest daughter. She is graduating from college this year with a duel degree in Elementary Education and Special Education. She has always had a kind heart and will no doubt positively impact the lives of many children and their families. I asked her if she would be willing to post on my blog. This is a family story she has grown up with.